The county’s dining scene skyrocketed when Chez Panisse alum Brian Collins came home to Arroyo Grande and opened Ember, whose centrally located wood-fired oven produces both smoky delicacies and eye-dazzling entertainment. Up the coast in Grover Beach, Chef Jacob Town delights with fried chicken and sourdough waffles as well as other soulful dishes at The Spoon Trade. In downtown San Luis Obispo, the bottles are boutique and farm-to-table plates pretty at Foremost Wine Company. Journey into Cayucos to chow down on the delectable smoked albacore tacos from Ruddell’s Smokehouse. Located in the Shell Beach area of Pismo Beach, just minutes from downtown SLO and Edna Valley, Dolphin Bay Resort & Spa’s comfortable suites are perfect to settle into for a long weekend. Avila Beach’s Avila La Fonda Hotel brings colorful Mexican design to the tiny, walkable hamlet. Downtown SLO’s Granada Hotel & Bistro, on the other hand, delivers upscale urban design, as do the nearby SLO Brew Lofts, where one-, two- and three-bedroom suites come with full kitchens, hip decor, a shared rooftop deck and brewery below. And the long-awaited Inn at the Pier in Pismo Beach opened this year. The soothing outdoor hot tubs at Sycamore Mineral Springs Resort & Spa are as fairly priced as they are tranquil. And if you’ve got kids in tow, hit Avila Valley Barn to feed some animals, load up on locally produced foods, eat grilled corn on the cob and learn about the region’s historic agricultural roots. 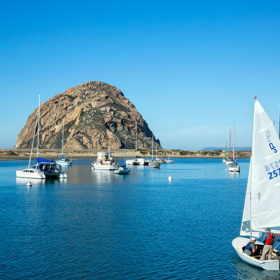 Get acquainted with the SLO Coast with a stay at the North Beach Campground in Pismo Beach, located right next to a monarch butterfly grove and just five minutes from the pier. Estates like Baileyana, Chamisal Vineyards, Claiborne & Churchill, Edna Valley Vineyard, Kynsi Winery, Talley Vineyards and Tolosa are just minutes apart on bucolic country roads off of Highway 227 and Orcutt Road, and each offers the classic tasting experience amid the vines. There’s a small urban scene starting to bubble in southeastern SLO, home to both Refugio Ranch Vineyards and Stephen Ross, where veteran vintner Stephen Ross Dooley pours a wide variety of options. To cast a wider net, try Tastes of the Valleys in Pismo, where co-owner Ash Mehta usually has more than 20 local bottles by the glass. Or check out The Station in SLO, where tasting, food pairing and educational events happen almost daily in a converted gas station. There’s also growing tasting scenes in both Arroyo Grande (Phantom Rivers, Timbre and Verdad) and Avila Beach (Croma Vera, Peloton Cellars and Sinor-LaVallee). Like much of the Central Coast, the weather is close to perfect all year long, save for a few rainy days. Being coastal, with cooling breezes from the ocean, it never gets too hot. Paso Robles to the north is known for powerful reds, but elegant, often delicate Pinot Noirs and racy, vibrant Chardonnays are found in the cool climes of the Edna and Arroyo Grande Valleys and a smattering of coastal sites to the north around Cayucos and Cambria. Styles range considerably, which means that more structured, rich and brawny Pinots can be found as well as savory Chards. There’s plenty of excitement around Rhône grapes, particularly peppery Syrah and rosy yet firm Grenache. Albariño, Grüner Veltliner, Pinot Gris and other aromatic whites are also making headway, while plots of old-vine Zinfandel can be found in the hills.